The LinkedIn acquisition in particular is a strategic move by Microsoft. Salesforce and LinkedIn had often danced around the idea of partnering, to infuse CRM data using LinkedIn information. With the acquisition of LinkedIn’s data set, Microsoft will have an opportunity to both continue to grow the existing business by selling it through its channels, differentiate its CRM product, Dynamics, and offer a sales productivity tool in Sales Navigator. Also, LinkedIn operates a monopoly on resume and employment data and, the business unit can be operated very profitably. Last, the great management team at LinkedIn will complement Microsoft’s. This acquisition will have three implications for startups. First, the transaction informs future M&A multiples. Second, the acquisition has the potential to upend the CRM market. Salesforce + RelateIQ and Microsoft Dynamics + LinkedIn. Two leading CRM products with some form of intelligent data entry; and that raises the question, Will being a CRM system of record without intelligence be enough to succeed? Third, this likely removes LinkedIn from the buyer segment of the M&A market as the company works through its sale. 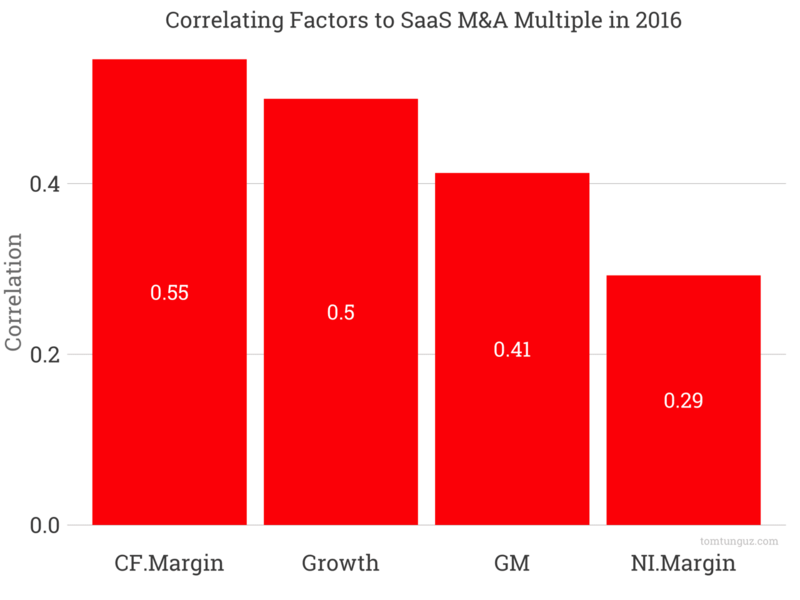 With nearly $40B in SaaS M&A so far this year, 2016 is shaping up to be the best year for SaaS M&A ever. All these data points are helpful to startups. These acquisitions set pricing comparables for the market, and will be used as benchmarks for future acquisitions. As the chart above shows, the highest correlated factor to acquisition multiple in 2016 is cash flow margin. 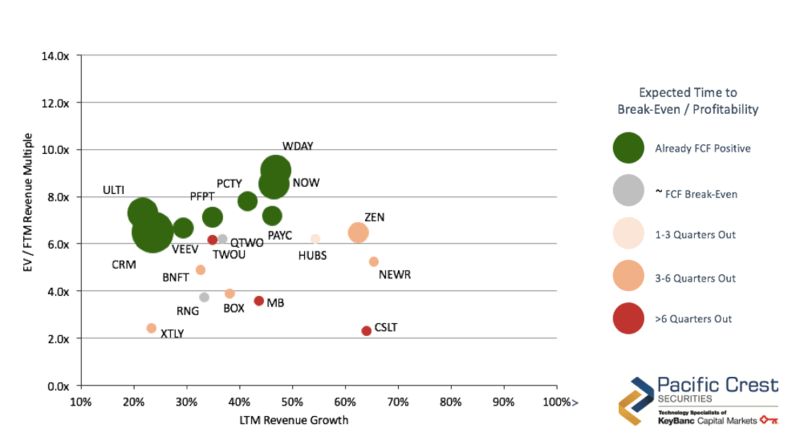 Revenue growth follows, and gross margin is third. Net income (profitability) is last. This is not surprising. Pacific Crest, an investment bank specializing in software companies, released this analysis at the Gainsight Pulse conference showing the correlation between free cash flow and enterprise value to next 12 month multiple. This means that public software companies are buying private ones using the same metrics as public investors. The LinkedIn acquisition is very likely the largest SaaS acquisition we’ll see for quite a while. In fact, it’s the largest software acquisition ever. And its effects will be felt for a long time to come. Disclosure: Redpoint and I hold LinkedIn shares.